The 2014–15 Ekstraklasa (currently named T-Mobile Ekstraklasa due to sponsorship reasons), is the 81st season of the highest level of football leagues in the Polish football league system since its establishment in 1927. It began on 18 July 2014. A total of 16 teams are participating, 14 of which competed in the league during the 2013–14 season, while the remaining two were promoted from the I Liga. Each team played a total of 30 matches, half at home and half away. Legia Warsaw were the defending champions, having won their 10th title last season, but Lech Poznań won their 7th title. Promotion and relegation as usual was determined by the position in the table from prior season. The bottom two teams were directly relegated to the I Liga, while the top two teams are promoted to the Ekstraklasa. Widzew Łódź and Zagłębie Lubin finished in 15th and 16th place, respectively, and were relegated to the Polish First League as a result. GKS Bełchatów and Górnik Łęczna finished 1st and 2nd, respectively, in the I Liga gained promotion. Rules for classification: 1) points; 2) head-to-head points; 3) head-to-head goal difference; 4) head-to-head goals scored; 5) goal difference; 6) number of goals scored; 7) Fair play table; head-to-head record is used only after all the matches between the teams in question have been played. Rules for classification: 1) points; 2) points in regular season; 3) head-to-head points in regular season; 4) head-to-head goal difference in regular season; 5) head-to-head away goals scored in regular season (if only two teams); 6) head-to-head goals scored in regular season (if more than two teams); 7) goal difference; 8) number of goals scored; 9) Fair Play table. 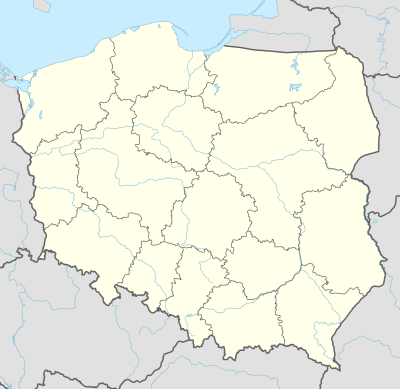 ^ a b Legia Warsaw qualifies for Europa League second qualifying round as winners of the 2014–15 Polish Cup and the spot for the runners-up (Europa League first qualifying round) is passed to the fourth placed team. As of matches played 7 June 2015. ^ "T-Mobile Ekstraklasa 2014/2015 - Kolejka 37". 90minut.pl. Retrieved 7 June 2015. ^ "Wojewoda zamknął stadion Lecha!". wp.pl. Retrieved 20 July 2014. ^ "T-Mobile Ekstraklasa 2014/2015 - Kolejka 1". 90minut.pl. Retrieved 20 July 2014. ^ a b "Analiza statystyczna Ekstraklasy 2014/2015". 90minut.pl. Retrieved 12 June 2015. ^ "Attendances – Archive Poland, 2014-2015, T-Mobile Ekstraklasa". EFS.co.uk. Retrieved 30 June 2015. ^ "Zmiany w zasadach ustalania kolejności w tabeli Ekstraklasy od sezonu 2011/2012". 8 July 2011 (in Polish). Ekstraklasa S.A. – official site. Retrieved 11 July 2011. ^ "ROZGRYWKI - ZASADY" (in Polish). Ekstraklasa S.A. – official site. Archived from the original on 2015-05-12. Retrieved 10 May 2015. ^ "Najlepsi strzelcy". ekstraklasa.org (in Polish). Archived from the original on 2014-07-29. Retrieved 19 July 2014. ^ "Asysty". wp.pl (in Polish). Retrieved 19 July 2014. This page was last edited on 4 February 2019, at 14:38 (UTC).